Experience backgammon, the Xbox Live Arcade way. From the creators of popular PC card games like Hardwood Hearts and Spades. Play a game of Hardwood Backgammon against the computer, against a friend on a single console, or against on online opponent over Xbox Live® on Xbox 360™. Move all of your checkers onto your home board, and then bear off before your opponent does. Roll two of a kind to double your number of moves. Catch your opponent with a vulnerable checker, and send him to the bar. And once you're sure you're going to win, use the doubling cube to bring you even closer to ultimate victory! Multiplayer: Play two players on Xbox Live or on the same console. Customizable items: Change environments (backgrounds, some with sound), dice, doubling cube, checkers, and playing board. Communicate: Fooms™, much like emotes, don't affect the game, but they might affect your mood—send Fooms such as a Kiss, Fireball, or Lightning at friends or opponents to let them know how you feel. Play a total of 100 games. Earn this in Single Player or Xbox Live play. Complete 10 games in Xbox Live play. Win a total of 25 games. Earn this in Single Player or Xbox Live play. Win 25 consecutive games. Earn this in Single Player or Xbox Live play. Win a total of 10 games. Earn this in Single Player or Xbox Live play. Hardwood Hearts is a Hearts game for Hearts fans. If you don't already play Hearts, you aren't likely to get much out of this one. Avoid the Queen of spades and duck as many points as you can. Hardwood Hearts will keep you in suspense on Xbox Live Arcade. Your mama told you not to go around breaking hearts. 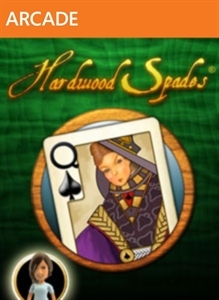 But in the classic card game ..
Hardwood Spades is a Spades game for Spades fans, but even fans of the card game will probably be a little put off by the dull graphics and sound. One of the best trump and bidding style games ever, Spades is easy to jump into, yet there is a lot of room to learn great strategy. It's a perfect blend of risk and skill. From the creators of po..
Soltrio Solitaire is a collection of 18 different solitaire games, offering co-op and competitive two-player solitaire game modes. In Soltrio Solitaire, play your favorite classic games like Spider, Klondike, FreeCell, and more, or play them with power-up bonuses, making your own playing cards in Voyage mode. Looking for some head-t..